I like ice cream. Ice cream is a sweet, magical, frozen food that comes in all sorts of flavors and often incorporates extra added goodies like nuts, candy, and fruit. But I should also tell you that I’m a bit of an ice cream snob, which is to say, I don’t eat ice cream that comes from the grocery store in large plastic buckets with red handles; I have standards. I also don’t eat ice cream instead of real food. It is a snack, a dessert, a treat, but it doesn’t replace the hardy and wholesome foods I eat to sustain life and bring pleasure to the palate. So if I look at the diet of movies I consume on a near-daily basis, I would have to say that Guardians of the Galaxy is ice cream. Good ice cream. It’s loaded with action and adventure from the beginning, and there are plenty of fascinating and colorful characters spewing witty banter throughout. And it’s just a lot of fun. Not the kind of fun I’d take little kids to see, because some of the fight scenes are pretty intense, and the language is definitely grownup. But with an age appropriate audience, it’s a pretty good ride for two solid hours. Now, I’m a comic book guy from way back, but I admit that Guardians of the Galaxy wasn’t really in my comic lexicon. I knew basically nothing about the storyline or the characters, but plenty of folks who had never read the books seemed to be enjoying the movie, so I figured I should check it out. I wasn’t in the least bit disappointed, but it also didn’t change my life. In fact, it didn’t make me think long and hard about some core belief, it didn’t expose hidden prejudices, it didn’t provide a meaningful glimpse into the human experience, and I was not moved by a hero’s introspective brooding that inspired him to move beyond his individual tragedy to save mankind. But it was really, really fun. The basic story revolves around Peter Quill, abducted from Earth as a child 26 years ago on the day his mother died, and who is now running around some distant quadrant of the galaxy committing petty crimes and pursuing pretty girls of various skin colors, including green, pink and blue. Sort of an intergalactic-bad-boy-with-a-heart-of-gold kind of thing. And he also likes to refer to himself as “Star-Lord,” although nobody else seems to care for the nickname. Peter ends up stealing an orb that is apparently quite valuable, and which is also apparently wanted by some of the most powerful beings in the universe. People chase him (some good and some bad, some human and some, uh, others), and there’s a lot of clever fighting and chasing and funny conversations. This culminates in prison for Peter, along with three of the folks he was fighting with, Gamora, Rocket and Groot, and things naturally get more complicated in a hurry. With the help of another inmate, Drax, they orchestrate a prison break and set out to sell the orb to the highest bidder. Peter Quill is brilliantly played by Chris Pratt, Vin Diesel (sparingly) voices the tree-like Groot, and Dave Bautista is the very intimidating (and very literal) Drax. Zoe Saldana is the green-skinned warrior Gamora, and Bradley Cooper provides something of the heart of the movie in the voice of Rocket, a bio-engineered, gun-toting, smart-mouthed robot raccoon. It’s sort of like Stagecoach set in outer space, but not really. 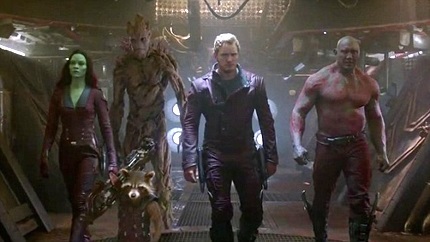 Along the way, this unlikely band of misfits become, accidentally, the Guardians of the Galaxy. Reluctant heroes, thrown together in the face of impossible odds, must somehow save the world from a really scary bad guy with a horrifyingly terrible weapon of mass destruction. Not much of a plot, really, and some of it is pretty predictable. But so what? I’ve got plenty of movies to watch that deal with the weightier matters of life. Love and sacrifice and redemption are given little more than lip service in this movie, but that isn’t why this movie exists. This movie is ice cream. In between the movies that make you think and make you cry and lead to long discussions with your friends and family, there are movies like Guardians of the Galaxy that are simply self-indulgent decadence to satisfy your cinematic sweet tooth. You’re not going to make a steady diet out of movies like this, but sometimes pure escapism action and adventure is about as refreshing as a big bowl of Ben and Jerry’s Chocolate Therapy, or Chubby Hubby, or Chunky Monkey. In fact, I think I’ve just decided what I’ll be treating myself to when Guardians of the Galaxy comes out on Blu-ray.